Bay Area Rapid Transit (BART) is a rapid transit public transportation system serving the San Francisco Bay Area in California. The heavy rail elevated and subway system connects San Francisco and Oakland with urban and suburban areas in Alameda, Contra Costa, and San Mateo counties. BART serves 48 stations along six routes on 112 miles (180 km) of rapid transit lines, including a ten-mile spur line in eastern Contra Costa County which utilizes diesel multiple-unit trains and a 3.2-mile (5.1 km) automated guideway transit line to the Oakland International Airport. With an average of 423,000 weekday passengers and 124.2 million annual passengers in fiscal year 2017, BART is the fifth-busiest heavy rail rapid transit system in the United States. Some of the Bay Area Rapid Transit system's current coverage area was once served by an electrified streetcar and suburban train system called the Key System. This early 20th-century system once had regular transbay traffic across the lower deck of the Bay Bridge, but the system was dismantled in the 1950s, with its last transbay crossing in 1958, and was superseded by highway travel. A 1950s study of traffic problems in the Bay Area concluded the most cost-effective solution for the Bay Area's traffic woes would be to form a transit district charged with the construction and operation of a new, high-speed rapid transit system linking the cities and suburbs. In 1962, San Mateo County supervisors voted to leave BART, saying their voters would be paying taxes to carry mainly Santa Clara County residents. The district-wide tax base was weakened by San Mateo's departure, forcing Marin County to withdraw a month later. Despite the fact that Marin had originally voted in favor of BART participation at the 88% level, its marginal tax base could not adequately absorb its share of BART's projected cost. Another important factor in Marin's withdrawal was an engineering controversy over the feasibility of running trains on the lower deck of the Golden Gate Bridge, an extension forecast as late as three decades after the rest of the BART system. The withdrawals of Marin and San Mateo resulted in a downsizing of the original system plans, which would have had lines as far south as Palo Alto and northward past San Rafael. Voters in the three remaining participating counties approved the truncated system, with termini in Fremont, Richmond, Concord, and Daly City, in 1962. Construction of the system began in 1964, and included a number of major engineering challenges, including excavating subway tunnels in San Francisco, Oakland, and Berkeley; constructing aerial structures throughout the Bay Area, particularly in Alameda and Contra Costa counties; tunneling through the Berkeley hills on the Concord line; and lowering the system's centerpiece, the Transbay Tube connecting Oakland and San Francisco, into a trench dredged onto the floor of San Francisco Bay. Passenger service began on September 11, 1972, initially just between MacArthur and Fremont. The rest of the system opened in stages, with the entire system opening in 1974 when the transbay service through the Transbay Tube began. The new BART system was hailed as a major step forward in subway technology, although questions were asked concerning the safety of the system and the huge expenditures necessary for the construction of the network. Ridership remained well below projected levels throughout the 1970s, and direct service from Daly City to Richmond and Fremont was not phased in until several years after the system opened. Some of the early safety concerns appeared to be well founded when the system experienced a number of train-control failures in its first few years of operation. As early as 1969, before revenue service began, several BART engineers identified safety problems with the Automatic Train Control (ATC) system. The BART Board of Directors was dismissive of their concerns and retaliated by firing them. Less than a month after the system's opening, on October 2, 1972, an ATC failure caused a train to run off the end of the elevated track at the terminal Fremont station and crash to the ground, injuring four people. The “Fremont Flyer” led to a comprehensive redesign of the train controls and also resulted in multiple investigations being opened by the California State Senate, California Public Utilities Commission, and National Transportation Safety Board. Hearings by the state legislature in 1974 into financial mismanagement at BART forced the General Manager to resign in May 1974, and the entire Board of Directors was replaced the same year when the legislature passed legislation leading to the election of a new Board and the end of appointed members. Even before the BART system opened, planners projected several possible extensions. Although Marin county was left out of the original system, the 1970 Golden Gate Transportation Facilities Plan considered a tunnel under the Golden Gate or a new bridge parallel to the Richmond-San Rafael Bridge to bring BART to Marin, but neither of these plans was pursued.. Over twenty years would pass before the first extensions to the BART system were completed to Colma and Pittsburg/Bay Point in 1996. An extension to Dublin/Pleasanton in 1997 added a fifth line to the system for the first time in BART's history. The system was expanded to San Francisco International Airport in 2003 and to Oakland International Airport via an automated guideway transit spur line in 2014. Construction of eBART, an extension using diesel multiple units along conventional railroad infrastructure between Pittsburg and Antioch, opened on May 26, 2018. BART's most significant current extension will take the system to the Silicon Valley. The first phase extended the Fremont line to Warm Springs/South Fremont in early 2017, and construction is underway on the line to Milpitas and Berryessa. Further expansion has been proposed, contingent upon the allocation of funding. This includes the second phase of the Silicon Valley extension, which would bring the system to downtown San Jose and Santa Clara. Plans have long been floated for an extension from Dublin to Livermore, which would cost approximately $1.2 billion and run 5.5 miles (8.9 km) along interstate 580 to Isabel Avenue. The BART board could vote in 2018 on this project, which would be completed in 2026. Other plans have included an extension to Hercules, a line along the Interstate Highway 680 corridor, and a fourth set of rail tracks through Oakland. [needs update] At least four infill stations such as Irvington and Calaveras on existing lines have been proposed. With the Transbay Tube nearing capacity, long-range plans included a new four-bore Transbay Tube beneath San Francisco Bay that would run parallel and south of the existing tunnel and emerge at the Transbay Transit Terminal to connect to Caltrain and the future California High Speed Rail system. The four-bore tunnel would provide two tunnels for BART and two tunnels for conventional/high-speed rail. The BART system and conventional U.S. rail use different and incompatible rail gauges and different loading gauges. Since the mid-1990s, BART has been trying to modernize its system. The fleet rehabilitation is part of this modernization; in 2009, fire alarms, fire sprinklers, yellow tactile platform edge domes, and cemented-mat rubber tiles were installed. The rough black tiles on the platform edge mark the location of the doorway of approaching trains, allowing passengers to wait at the right place to board. All faregates and ticket vending machines were replaced. In 2007, BART stated its intention to improve non-peak (night and weekend) headways for each line to 15 minutes. The current 20-minute headways at these times is a barrier to ridership. In mid-2007, BART temporarily reversed its position stating that the shortened wait times would likely not happen due to a $900,000 state revenue budget shortfall. Nevertheless, BART eventually confirmed the implementation of the plan by January 2008. Continued budgetary problems halted the expanded non-peak service and returned off-peak headways to 20 minutes in 2009. In 2008, BART announced that it would install solar panels at two yards and maintenance facilities and the Orinda station (the only station with enough sun to justify installation cost). In 2012, The California Transportation Commission announced they would provide funding for expanding BART facilities, through the Santa Clara Valley Transportation Authority, in anticipation of the opening of the Silicon Valley Berryessa Extension. $50 million would go in part to improvements to the Hayward Maintenance Complex. During the 1989 Loma Prieta earthquake, the BART equipment was mostly undamaged. A 2010 study shows that along with some Bay Area freeways, some of BART's overhead structures could collapse in a major earthquake, which has a significant probability of occurring within three decades. Seismic retrofitting has been carried out in recent years to address these deficiencies, especially in the Transbay Tube. The entirety of the system runs in exclusive right-of-way. BART's rapid transit revenue routes cover about 110 miles (180 km) with 48 stations. On the main lines, approximately 28 miles of lines run through underground sections with 32 miles on elevated tracks. The main system uses a 5 ft 6 in (1,676 mm) broad gauge and mostly ballastless track. Originally utilizing flat-edge rail and wheelsets with cylindrical treads, BART is now switching to conical tread to reduce the noise caused by flange/rail contact and loss of adhesion of one of the wheels on curves. DC electric current at 1,000 volts is delivered to the trains over a third rail. An automated guideway transit line and an additional station were opened in 2014 and utilize off-the-shelf cable car technology developed by DCC Doppelmayr Cable Car: the Cable Liner. The section of the Antioch-SFO/Millbrae line east of the Pittsburg/Bay Point station runs on conventional unelectrified 1,435 mm (4 ft 8 1⁄2 in) standard gauge rail. Schedules call for trains to operate at up to 70 miles per hour (110 km/h), but certain segments (in particular, the Transbay Tube) are designed for 80 mph (130 km/h) operation when making up delays. Rapid transit trains have 4–10 cars, the maximum length of 710 feet (216 m) being the longest of any metro system in the United States and extending slightly beyond the 700-foot (213 m) platforms. Cars are 10.5 feet (3.2 m) wide, the maximum gradient is four percent, and the minimum curve radius is 394 feet (120 m). Train frequencies are primarily limited by the fact that most lines funnel into the Transbay Tube and San Francisco. While small sections of track in Oakland, Colma, and Daly City are triple- and quadruple-tracked, there are few sidings which would allow limited-stop or express trains to pass others. The combination of unique loading gauges and bespoke rail technologies has complicated maintenance of the system, as rolling stock requires custom wheelsets, brake systems, and power systems. BART operates six named and interlined heavy rail services plus one separate automated guideway line. Five of the heavy rail services run through Oakland, and all of those but the Richmond–Warm Springs/South Fremont line and the SFO–Millbrae shuttle go through the Transbay Tube to San Francisco. All six services run on weekdays until the end of the afternoon rush hour; evenings (after about 7:00 pm), nights (after about 9:00 pm), and Sundays have as few as three services operating. Three of the services change terminals at certain times so that all stations are served during all service hours. Unlike most other rapid transit and rail systems around the world, BART lines are not primarily referred to by shorthand designations or their color names (although the colors used on maps have been constant since 1980). The services are mainly identified on maps, schedules, and station signage by the names of their termini. However, the new fleet displays line colors more prominently, and BART has begun to use color names in press releases and GTFS data. The mainline BART network operates six types of electrically-operated, self-propelled railcars, built from four separate orders. The first four types, built from 1968 until 1996, total 669 cars (although 662 are currently available for revenue service), and have two sets of passenger doors on each side of the car. The newer two types, which are technologically incompatible with the older types, are in the process of manufacturing, delivery, and commissioning, and are due to replace all older types by 2022 while simultaneously expanding the fleet for future extensions. They will all feature three sets of passenger doors on each side of the car to speed up passenger boarding. To run a typical peak morning commute, BART requires 579 cars. Of those, 535 are scheduled to be in active service; the others are used to build up four spare trains (essential for maintaining on-time service). At any one time, the remaining 90 cars are in for repair, maintenance, or some type of planned modification work. The vehicle procurement for eBART included eight Stadler GTW diesel railcars, with two options to purchase six more. The first of these trains were delivered in June 2016. The Stadler GTW trains are diesel multiple units with 2/6 articulated power units, and are based on models previously used in Austin, Texas; Denton, Texas (greater Dallas) and New Jersey. 60 1xxx 1968–1971 WABCO N -3 To be phased out by August 2023 and replaced by the "D" and "E" cars. 310 3xxx 2012– Scharfenberg Order being filled/testing, entered service on January 19, 2018. BART has ordered 775 new cars from manufacturer Bombardier Transportation: 310 cab cars (D-cars, which must be the end cars, and can be at any position in a train, although unlike both types of C-cars will not permit passengers to move freely between cars past the operator cab) and 465 non-cab cars (E-cars, which can not be "end cars"). The new cars have three doors on each side (increased from the current two, to speed station stops), bike racks, 54 seats per car, and interior displays giving next-stop information. The new cars' couplers are incompatible with all prior cars and must run in separate trains. The first test car was unveiled in April 2016; upon approval, the first 10 cars were expected to be in service in December 2016, however, glitches delayed entry into service for one year. In early November 2017, a test train failed a CPUC regulatory inspection due to door issues, leaving the planned revenue service date in doubt. The first ten-car train received CPUC certification on January 17, 2018, with revenue service beginning two days later. Delivery of all 775 cars is expected to be completed by Fall 2022. The first inbound trains leave outer terminals around 5:00 am on weekdays, 6:00 am on Saturdays, and 8:00 am on Sundays and most holidays. (The previous 4:00 am weekday start time was changed to 5:00 am for three years starting on February 11, 2019 to accommodate retrofitting of the Transbay Tube. That project also reduced weekday evening service from every 20 minutes to every 24 minutes to allow for construction work in one track of the Tube during those times.) The last inbound trains leave their terminals around midnight, with the final Antioch–SFO/Millbrae line and Richmond–Warm Springs/South Fremont line trains in both directions meeting at MacArthur station for guaranteed transfers. Two different bus networks operated by regional transit agencies run during the overnight hours when BART is not operating. The All Nighter is a regional network providing basic overnight service to much of the Bay Area. Most BART stations are served (directly or within several blocks) by the All Nighter system except for the Antioch–Rockridge and Bay Fair–Dublin/Pleasanton segments plus Warm Springs/South Fremont station. A network of 15 BART-specific routes operated by regional agencies run between 3:50 am and 5:30 am to replace early-morning weekday BART service during the Transbay Tube retrofit project. Two San Francisco/Peninsula routes, seven Transbay routes, and five East Bay routes run between a limited number of major BART stations, with the San Francisco/Peninsula and Transbay routes meeting at the Temporary Transbay Terminal. Fares on BART are comparable to those of commuter rail systems and are higher than those of most subways, especially for long trips. The fare is based on a formula that takes into account both the length and speed of the trip. A surcharge is added for trips traveling through the Transbay Tube, to Oakland International Airport, to San Francisco International Airport, and/or through San Mateo County, a county that is not a member of the San Francisco Bay Area Rapid Transit District. Passengers can use refillable paper-plastic-composite tickets, on which fares are stored via a magnetic strip, to enter and exit the system. The exit faregate prints the remaining balance on the ticket each time the passenger exits the station. 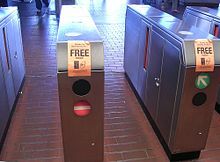 A paper ticket can be refilled at a ticket machine, the remaining balance on any ticket can be applied towards the purchase of a new one, or a card is captured by the exit gate when the balance reaches zero; multiple low value cards can be combined to create a larger value card but only at specific ticket exchange locations, located at some BART stations. The magnetic strip-based technology was developed by Cubic Transportation Systems with a contract awarded in 1974. BART relies on unused ticket values on discarded low-value cards for additional revenue, as much as $9.9 million. The paper ticket technology is identical to the Washington Metro's former paper fare card, though the BART system does not charge higher fares during rush hour. The minimum fare is $2.00 (except San Mateo County trips) under 6 miles (9.7 km). The maximum one-way fare including all possible surcharges is $16.15, the journey between San Francisco International Airport and Oakland International Airport. The farthest possible trip, from Antioch to Millbrae, costs less because of the $4 additional charge added to SFO trips and $6 additional charge added to OAK trips. Entering and exiting the same station within three hours accrues an excursion fare of $5.75. Passengers without sufficient fare to complete their journey must use a cash-only AddFare machine to pay the remaining balance in order to exit the station. Special color-coded tickets provide steep discounts for children, the disabled, seniors, and students.BART Plus, a special high-value ticket with "flash-pass" privileges with some regional transit agencies, is being phased out in favor of the Clipper system. Unlike many other rapid transit systems, BART does not have an unlimited ride pass, and the only discount provided to the public is a 6.25% discount when "high value tickets" are purchased with fare values of $48 and $64, for prices of $45 and $60 respectively. Amtrak's Capitol Corridor and San Joaquins trains sell $10 BART tickets on board in the café cars for only $8, resulting in a 20% discount. A 62.5% discount is provided to seniors, the disabled, and children age 6 to 12. Middle and high school students 13 to 19 may obtain a 50% discount if their school participates in the BART program; these tickets are intended to be used only between the students' home station and the school's station and for transportation to and from school events. The tickets can be used only on weekdays. These School Tickets and BART Plus tickets have a last-ride bonus where if the remaining value is greater than $0.05, the ticket can be used one last time for a trip of any distance. Most special discounted tickets must be purchased at selected vendors and not at ticket machines. The BART Plus tickets can be purchased at the ticket machines. The San Francisco Muni "A" monthly pass provides unlimited rides within San Francisco, with no fare credit applied for trips outside of the city. San Francisco pays $1.02 for each trip taken under this arrangement. Proposals to simplify the fare structure abound. A flat fare that disregards distance has been proposed, or simpler fare bands or zones. Either scheme would shift the fare-box recovery burden to the urban riders in San Francisco, Oakland and Berkeley and away from suburban riders in East Contra Costa, Southern Alameda, and San Mateo Counties, where density is lowest, and consequently, operational cost is highest. For most of its history, BART's ridership has reflected the U.S. economy, growing modestly during periods of economic expansion and dropping slightly during recessions. A major exception occurred in 1989 in the aftermath of the Loma Prieta earthquake, which severely damaged the San Francisco–Oakland Bay Bridge, causing its closure for a month. BART became the only direct route between the East Bay and San Francisco, resulting in a nearly 17% ridership jump for the 1990 fiscal year. Ridership did not drop back to previous levels after the repair of the bridge, suggesting that many commuters chose to stick with BART. BART ridership has grown rapidly since 2010, mirroring strong economic growth in the Bay Area. In 2015, the system was carrying approximately 100,000 more passengers each day than it had five years earlier. High gasoline prices also contributed to growth, pushing ridership to record levels during 2012, with the system recording five record ridership days in September and October 2012. After six straight years of expansion, ridership growth began to slow in late 2016, dropping by 1.7% in October 2016 from the prior year. Although the fiscal year ending June 30, 2017 showed an average weekday ridership of 423,395, the second-highest in BART's history, this was a 2.3% drop from FY 2016. Some see this decline as part of an overall national trend of declining transit use in large U.S. cities, linked to changes in commute patterns, the fall in gasoline prices since 2014, and competition from the private sector in the form of ride-sharing services such as Uber and Lyft. The line to the San Francisco International Airport lost riders, while ride-sharing services grew by a factor of almost six or nearly 500% at the airport between 2014 and 2016. BART planners believe that competition from Uber and Lyft is reducing overall ridership growth and BART's share of SFO airport transit. Stations in the urban cores of San Francisco, Oakland, and Berkeley have the highest ridership, while suburban stations record lower rider numbers. During fiscal year 2017, the busiest station was Embarcadero with 48,526 average weekday exits, followed by Montgomery Street with 45,386. The busiest station outside of San Francisco was 12th Street Oakland City Center with 13,965 riders, followed by 19th Street Oakland with 13,456. The least busy station was Oakland International Airport with 1,517 riders, while the least busy standard BART station was North Concord / Martinez with 2,702 weekday exits. BART's one-day ridership record was set on Halloween of 2012 with 568,061 passengers attending the San Francisco Giants' victory parade for their World Series championship. This surpassed the record set two years earlier of 522,198 riders in 2010 for the Giants' 2010 World Series victory parade. Before that, the record was 442,100 riders in October 2009, following an emergency closure of the Bay Bridge. During a planned closure of the Bay Bridge, there were 475,015 daily riders on August 30, 2013, making that the third highest ridership. On June 19, 2015, BART recorded 548,078 riders for the Golden State Warriors championship parade, placing second on the all-time ridership list. BART set a Saturday record of 419,162 riders on February 6, 2016, coinciding with Super Bowl 50 events and a Golden State Warriors game. That easily surpassed the previous Saturday record of 319,484 riders, which occurred in October 2012, coinciding with several sporting events and Fleet Week. BART set a Sunday ridership record of 292,957 riders in June 2013, in connection with the San Francisco Gay Pride Parade, surpassing Sunday records set the previous two years when the Pride Parade was held. BART and all lines of the Muni Metro light rail system share four stations (Embarcadero, Montgomery Street, Powell Street, and Civic Center/UN Plaza), in the two-level Market Street Subway. Connections are also available to three lines at Balboa Park station and one line at Glen Park station. The under-construction first phase of Silicon Valley BART extension will provide a connection to VTA Light Rail at Milpitas station upon opening. Many BART stations offer parking, however, under-pricing causes station parking lots to overflow in the morning. Pervasive congestion and under-pricing forces some to drive to distant stations in search of parking. BART hosts car sharing locations at many stations, a program pioneered by City CarShare. Riders can transfer from BART and complete their journeys by car. BART offers long-term airport parking through a third-party vendor at most East Bay stations. Travelers must make an on-line reservation in advance and pay the daily fee of $5 before they can leave their cars at the BART parking lot. In 2004, BART became the first transit system in the United States to offer cellular telephone communication to passengers of all major wireless carriers on its trains underground. Service was made available for customers of Verizon Wireless, Sprint/Nextel, AT&T Mobility, and T-Mobile in and between the four San Francisco Market Street stations from Civic Center to Embarcadero. In 2009, service was expanded to include the Transbay Tube, thus providing continuous cellular coverage between West Oakland and Balboa Park. In 2010, service was expanded to all underground stations in Oakland (19th Street, 12th Street/Oakland City Center, and Lake Merritt). Uninterrupted cellular coverage of the entire BART system is a goal. As of 2012[update] passengers in both the Berkeley Hills tunnel and the Berkeley subway (Ashby, Downtown and North Berkeley) received cell service. The only section still not covered by cell service is a short tunnel that leads to Walnut Creek BART, and San Mateo County subway stations (including service to SFO and Millbrae). In 2007, BART ran a beta test of Wi-Fi Internet access for travelers. It initially included the four San Francisco downtown stations: Embarcadero, Montgomery, Powell, and Civic Center. It included above ground testing to trains at BART's Hayward Test Track. The testing and deployment was extended into the underground interconnecting tubes between the four downtown stations and further. The successful demonstration provided for a ten-year contract with WiFi Rail, Inc. for the services throughout the BART right of way. In 2008, the Wi-Fi service was expanded to include the Transbay Tube. BART terminated the relationship with Wi-Fi Rail in December 2014, citing that WiFi Rail had not submitted an adequate financial or technical plan for completing the network throughout the BART system. In 2011, during the Charles Hill killing and aftermath BART disabled cell phone service to hamper demonstrators. The ensuing controversy drew widespread coverage, that raised legal questions about free speech rights of protesters and the federal telecommunications laws that relate to passengers. In response, BART released an official policy on cutting off cell phone service. Since 2008, the district has been adding Library-a-Go-Go book vending machines. The Contra Costa County Library machine was added to the Pittsburg/Bay Point station in 2008. The $100,000 machine, imported from Sweden, was the first in the nation and was followed by one at the El Cerrito del Norte station in 2009. Later in 2011 a Peninsula Library System machine was added at the Millbrae Station. The San Francisco Bay Area Rapid Transit District is a special district consisting of Alameda County, Contra Costa County, and the City and County of San Francisco. San Mateo County, which hosts six BART stations, is not part of the BART District. A nine-member elected Board of Directors represents nine districts. BART has its own police force. While the district includes all of the cities and communities in its jurisdiction, some of these cities do not have stations on the BART system. This has caused tensions among property owners in cities like Livermore who pay BART taxes but must travel outside the city to receive BART service. In areas like Fremont, the majority of commuters do not commute in the direction that BART would take them (many Fremonters commute to San Jose, where there is currently no BART service). This would be alleviated with the completion of a BART-to-San Jose extension project and the opening of the Berryessa Station in San Jose. BART, like other transit systems of the same era, endeavored to connect outlying suburbs with job centers in Oakland and San Francisco by building lines that paralleled established commuting routes of the region's freeway system. The majority of BART's service area, as measured by percentage of system length, consists of low-density suburbs. Unlike the Chicago "L" or the London Underground, individual BART lines do not provide frequent local service. Within San Francisco city limits, Muni provides local light rail surface and subway service, and runs with smaller headways (and therefore provides more frequent service) than BART. In the 1970s, BART had envisioned frequent local service, with headways as short as two minutes between trains on the quadruple-interlined section in San Francisco and six minutes on each individual line. However, headways have fallen short of the original plans. While trains do arrive every three minutes on the quadruple-interlined section between West Oakland and Daly City during weekday commute hours, each individual line operates at 15 minute intervals. BART could be characterized as a "commuter subway," since it has many characteristics of a regional commuter rail service, somewhat similar to S-Bahn services in Germany, Denmark, Austria and Switzerland, such as lengthy lines that extend to the far reaches of suburbia, with significant distances between stations. BART also possesses some of the qualities of a metro system in the urban areas of San Francisco and Oakland; where multiple lines converge, it takes on the characteristics of an urban metro, including short headways and transfer opportunities to other lines. Urban stations are as close as one-half mile (800 m) apart, and have combined 2​1⁄2- to 5-minute service intervals at peak times. In January 1979, an electrical fire occurred on a train as it was passing through the Transbay Tube. One firefighter (Lt. William Elliott, 50, of the Oakland Fire Department) was killed in the effort to extinguish the blaze. Since then, safety regulations have been updated. On October 14, 2008, track inspector James Strickland was struck and killed by a train as he was walking along a section of track between the Concord and Pleasant Hill BART stations. Strickland's death started an investigation into BART's safety alert procedures. At the time of the accident, BART had assigned trains headed in opposite directions to a shared track for routine maintenance. BART came under further fire in February 2009 for allegedly delaying payment of death benefits to Strickland's family. On January 1, 2009, a BART Police officer, Johannes Mehserle, fatally shot Oscar Grant III. BART held multiple public meetings to ease tensions led by BART Director Carole Ward Allen who called on the BART Board to hire two independent auditors to investigate the shooting, and to provide recommendations to the board regarding BART Police misconduct. Director Ward Allen established BART's first Police Department Review Committee and worked with Assemblyman Sandre Swanson to pass AB 1586 in the California State Legislature, which enforced civilian oversight of the BART Police Department. BART Director Lynette Sweet said that "BART has not handled this [situation] correctly," and called for the BART police chief and general manager to step down, but only one other BART Director, Tom Radulovich, has supported such action. Eyewitnesses gathered direct evidence of the shooting with video cameras, which were later submitted to and disseminated by media outlets and watched hundreds of thousands of times in the days following the shooting. Violent demonstrations occurred protesting the shooting. Mehserle was arrested and charged with murder, to which he pleaded not guilty. Oakland civil rights attorney John Burris filed a US$25 million wrongful death claim against the district on behalf of Grant's daughter and girlfriend. Oscar Grant III's father also filed a lawsuit claiming that the death of his son deprived him of his son's companionship. Mehserle's trial was subsequently moved to Los Angeles following concerns that he would be unable to get a fair trial in Alameda County. On July 8, 2010, Mehserle was found guilty on a lesser charge of involuntary manslaughter. He was released on June 13, 2011 and is now on parole. On July 3, 2011, two officers of the BART Police shot and killed Charles Hill at Civic Center Station in San Francisco. Hill was allegedly carrying a knife. On August 12, 2011, BART shut down cellphone services on the network for three hours in an effort to hamper possible protests against the shooting and to keep communications away from protesters at the Civic Center station in San Francisco. The shutdown caught the attention of Leland Yee and international media, as well as drawing comparisons to the former Egyptian president Hosni Mubarak in several articles and comments. Antonette Bryant, the union president for BART, added that, "BART have lost our confidence and are putting rider and employee safety at risk." Members of Anonymous broke into BART's website and posted names, phone numbers, addresses, and e-mail information on the Anonymous website. On August 15, 2011, there was more disruption in service at BART stations in downtown San Francisco. The San Francisco Examiner reported that the protests were a result of the shootings, including that of Oscar Grant. Demonstrations were announced by several activists, which eventually resulted in disruptions to service. The protesters have stated that they did not want their protests to results in closures, and accused the BART police of using the protests as an excuse for disruption. Protesters vowed to continue their protests every Monday until their demands were met. On August 29, 2011, a coalition of nine public interest groups led by Public Knowledge filed an Emergency Petition asking the U.S. Federal Communications Commission (FCC) to declare "that the actions taken by the Bay Area Rapid Transit District (“BART”) on August 11, 2011 violated the Communications Act of 1934, as amended, when it deliberately interfered with access to Commercial Mobile Radio Service (“CMRS”) by the public" and "that local law enforcement has no authority to suspend or deny CMRS, or to order CMRS providers to suspend or deny service, absent a properly obtained order from the Commission, a state commission of appropriate jurisdiction, or a court of law with appropriate jurisdiction". In December 2011 BART adopted a new "Cell Service Interruption Policy" that only allows shutdowns of cell phone services within BART facilities "in the most extraordinary circumstances that threaten the safety of District passengers, employees and other members of public, the destruction of District property, or the substantial disruption of public transit service". According to a spokesperson for BART, under the new policy the wireless phone system would not be turned off under circumstances similar to those in August 2011. Instead police officers would arrest individuals who break the law. In February 2012, the San Francisco District Attorney concluded that the BART Police Officer that shot and killed Charles Hill at the Civic Center BART station the previous July "acted lawfully in self defense" and will not face charges for the incident. A federal lawsuit filed against BART in January by Charles Hill's brother was proceeding. In March 2012, the FCC requested public comment on the question of whether or when the police and other government officials can intentionally interrupt cellphone and Internet service to protect public safety. On the afternoon of October 19, 2013, a BART employee and a contractor, who were inspecting tracks, were struck and killed near Walnut Creek by a train being moved for routine maintenance. 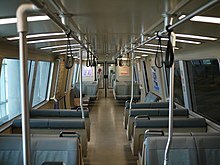 A labor strike by BART's two major unions was underway at the time, which caused BART to use an undertrained operator. Instead of the usual 14 weeks of the training, the operator only received four. The BART trainer was not in the cab with the operator at the time of impact but was instead in the passenger compartment. BART was fined $600,000 for the incident. In July 2017, a BART rider created a website, "bartcrimes.com", to disseminate information he thought BART makes very difficult to find on their website, intentionally making it inconvenient to access crime logs, which are public information. BART officials say crime rates remain low. However, according to data requested by the San Francisco Chronicle after the mob robbery in April, figures showed a 45 percent increase in robberies aboard BART trains in its stations during the first quarter of the year. In September 2017, six victims of the robberies/assaults filed suit against BART for gross negligence, claiming BART does not provide adequate security for its riders. On July 22, 2018, a man fatally stabbed 18-year-old Nia Wilson with a knife as she exited a train car at the MacArthur station. This was the third homicide at a BART station within five days.